1.25" is too small, even with all those gussets (I've been planning on this size since October)? I'd rather not redraw the entire blueprint; could I just use thicker tubing of the same diameter? I apparently lost the pink bike's headset. I think it went out with the recycling at some point. Shooooot. So I sourced a Raleigh Grand Prix frame with bent seat stay for free from a friend. I chopped it apart and realized the top and down tubes are the same size I'd been planning on using, so I no longer have to buy tube stock. With a new angle grinder in my hands, I cleaned the lugs off the Raleigh's head tube and with a hole saw got 90% done fishmouthing the new down tube. Next is to work on the down tube to "top" (bottom?) tube junction and to work the second (free spirit-sourced) head tube into that. And cut a couple gussets for my friend to weld in when he does the other stuff. 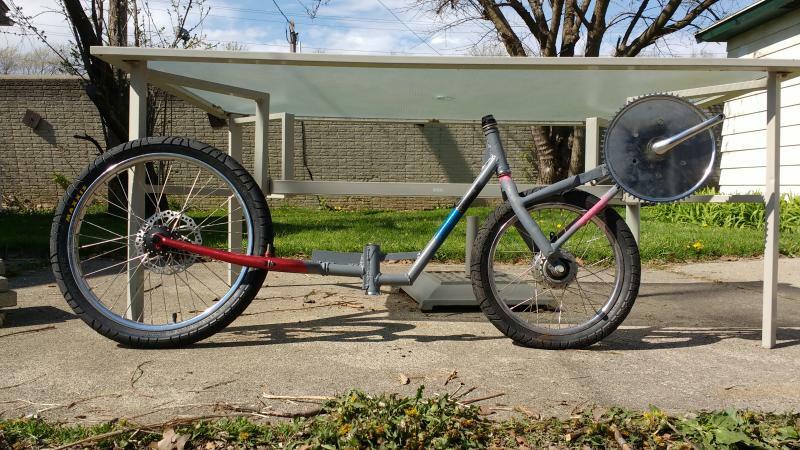 At this point, the split-apart folding frame idea is off the table. It's too much complexity for little benefit. My new push is to get this made into a frame (probably not even really painted) by a week and a half from now, if that is possible, so I can show it with my trailers and fatbike at the "Maker Fest" at work on the 28th IIRC. A long shot is to get it rideable and ride it to the MHPVA race at Waterford Hills in June. I don't know if I'll make that, but it's a good goal to am for. 22 April: Price list updated to reflect jig building costs. Last edited by Sven7; 04-22-2016 at 08:06 PM..
Wooooo! I got it welded! After working for 15+ hours this week I got a jig made of 3/4" MDF and leftover 2x4 scraps. I did my best with the tools I had; the miter saw was very useful! I then prepped the rest of the tubing, with a few different options for alternate welding strategies. I am not a welder, so I wasn't sure which would work best. I took it over to a friend's house and he worked for three hours to get it put together while I made inconsequential design decisions. There were quite a few loose ends to tie up but it's together now. I'm gaining tons of experience that I'll be able to use on a hypothetical version 2. When I got the bearing races pressed back in at the LBS I had them weigh the bare frame without fork. 3 lbs, 14 ounces. Not bad for a steel frame. If this is all the further I get before the show at work, that's okay. I'm tired and broke, haha. -Get bearings and a stem that fit the rear steer tube; install. -Center the crankset to get the chainline reasonable. -Grind the front dropouts longer to have a little chain tensioning capability. -Mock up rear brake mount. -Acquire heim joints, etc to hook up the remote steering. At that point the bike should be rideable around the block. Updated list. Welding cost more than I had hoped, but I could have planned the thing better so it took a lot of time. Live and learn. The 'bent drew quite a few interested visitors at the Maker Fest! It was a good time. I wasn't planning on painting the fork for a while, but had the bottom bracket cups out so figured why not. It's a nice light blue now, but you'll see pictures eventually when something more interesting happens. I threw in a spacer washer to move the crankset to the drive side just a few mils but that turned out to be both too little to straighten out the chain line and too much for the washer/nut stackup on the non drive side. So that idea's out the window. What I'm figuring on doing to solve that is to mount the chainring normally without a spacer, then to create a two-piece chainring system. 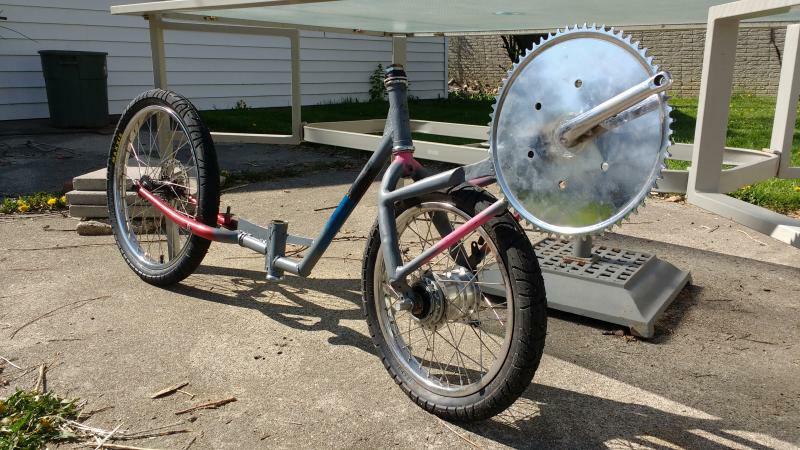 I'll cut the outside part off the chainring that's mounted to the crank, and that'll act as a carrier. Then I'll cut the inside out of another chainring and bolt that to the carrier via the 6 holes they all have. That should give me the opportunity to space it as little or as much as I need to straighten the chain line, but still have proper BB adjustment and crankarm clearance. Lastly, I got new rear headset bearing cups at the LBS, so the rear steer tube is installed. Finding a good stem/handlebar combo to fit the 10-spd steer tube is the next challenge. I can file down the stem I have to fit the just-barely-larger-diameter handlebars, or find a stem that fits correctly. Money versus time. Stay tuned! Last edited by Sven7; 05-01-2016 at 09:59 PM..